Quiet Designer 2-bedroom apartment in heart of historic Cadiz near two beaches. 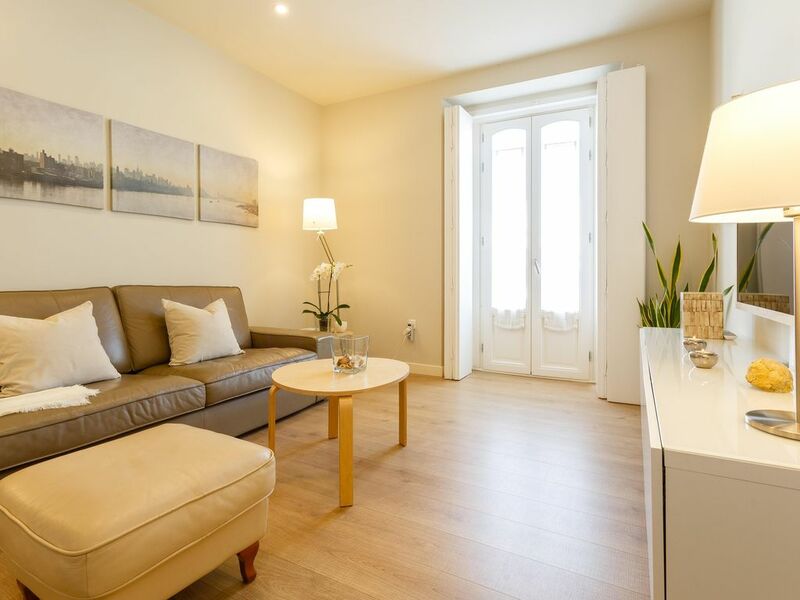 Splendid, new flat in a classic, newly-renovated building in the heart of monumental Cadiz. This beautiful, 4th-floor apartment, flooded with light, is elegant and peaceful with clean and contemporary design. The entrance hall carries you past the lofty window gallery that opens onto the quiet, traditional interior patio. The open-plan kitchen/living room features a balcony over the pedestrian street (no traffic) with views over the rooftops and spires of Cadiz as well as a lateral view of the Cathedral. This handsome designer space, as well as the entire apartment, is both casual and luxurious with wooden floors, custom-fitted wooden interior shutters, and first-rate air conditioning/heating throughout. The living area provides serenity and comfort with its clean lines, natural leather sofa, pure wool carpet, large flat-screen TV and docking station for your music. The kitchen and dining area is a compact and gorgeous work of minimalist design in white and natural wood colours. It comes entirely equipped with premium Silestone counters, an easy-to-clean induction cooker, dishwasher, large refrigerator, microwave, washing machine and nespresso machine. All these premium appliances are integrated behind push-open cabinets and therefore hidden to the eye. The bedrooms are located at the back of the apartment over the patio of an 18th century convent. Absolute tranquility and natural light. All mattresses are new and premium quality; as are the pillows and the natural 100% cotton bedding. The master bedroom has a large King-size bed (160 x 200 cm), twin nightstands with reading lights, full-length mirror, vanity/working table, and a large flat-screen TV. The second bedroom has two European singles (90 x 200 cm). Both bedrooms have spacious, custom built wardrobes and excellent blinds. The bathroom is finished with traditional Spanish-tile floor, a large shower, designer basin resting on a custom built cabinet with two big drawers, and a wall-mounted, magnification makeup mirror. The building is from the turn of the 18th-19th century and has just been completely renovated inside and out-- always respecting its historical character and highlighting the elegant facade, wrought-iron balconies, soaring glazed window gallery on the interior patio, and original stucco/plaster embellishments. All utilities and infrastructure are new, like the lift that carries you to the apartment or higher up to the acessible rooftop with spectacular views of the Cathedral, the oceans and all Cadiz. The apartment is wheelchair accessible. The location itself is also unbeatable. Situated on the short, pedestrian street called Calle Compañía, with the monumental Cathedral plaza at one end, and the quaint flower-market plaza and local food market with tapas bars, at the other. Calle de la Compañía is easily one of the most enjoyble and emblematic streets in Cadiz. Countless other monumental squares, churches, ramparts, and buildings are only a few minutes walk; so too are the endless succession of excellent tapas bars, restaurants, and taverns that make Cadiz famous. Just 150 metres from the front door is the impressive seawall walk and bikepath with incredible, sweeping views of the Atlantic. From here you can easily reach either of the two nearest beaches in 10-15 minutes walking. La Caleta is a small cove in the center of the old town full of character: tiny fishing boats, a 19th century bath house, and the requisite bars-terraces. The Playa Santa María del Mar, in the other direction, is the first of Cadiz’s wide, sandy beaches to the south that are considered some of the best in Spain. So all the places of cultural, historical, gastronomical, recreational, and logistical interst are extremely close. A car is not necessary, but there is inexpensive parking a 4 minute walk from yout front door. You will never forget your stay, and you are sure to return, to this laid-back and graceful Andalusian Paradise. Cadiz, Spain’s oldest city, is full of charm and surprises. I am a Spanish woman married to an American and mother of three children. We live in " El Puerto De Santa María" where I teach English. I love travelling and I know how important it is to find a place where you can feel at home. This is why I worked hard to offer you a comfortable, quality stay in our apartment. I have been living in El Puerto de Santa María , a town close by, for 13 years and since the first time I visited the centre of Cadiz, I fell in love with it. After nearly two years of searching we finally found this excellent apartment in the perfect place. The apartment is brand new, comfortable, stylish, quiet and full of natural light. The location is the best in town because it is in a monumental area where you can walk everywhere : restaurants, museums, shops, beaches... You will love it. make sure you see a the symbol of a sun on the screen, if not, select it. then you select the temperature and the fan power. Fantastic property to explore Cadiz. Situated in a central but quiet area next to the Cathedral, the apartment is spacious, modern, spotlessly clean and features everything you could want or need for a relaxing holiday (including good wifi and Netflix!). Carmen is a lovely lady and you will fall in love with her and the wonderful, friendly city of Cadiz. Cadiz is a magical city, which is perfect to visit other towns near by. Lovely place to stay, very comfortable, close to main town attractions, very lighted modern flat with very comfortable beds and pillows. The location is great, right by the Cathedral, within easy walking distance from everything. I will certainly go back to this place. Public parking is very close and very reasonable per day. Carmen is an amazing host. I truly recommend this place. Thanks Carmen for sharing this reasure in Cadiz. Thanks very much for this wonderful review. You are a fantastic guest . Excellent apartment right in the centre of Cadiz. Very clean and well equipped. Beds really comfortable. The goodies in the fridge were welcome so we could have a drink when we arrived. Carmen responded to emalis quickly. Would highly recommend. The best location you can get, totally equipped with everything you could need, impeccable clean, very quiet to sleep....what else can be said? Absolutely excellent!!! Thanks very much for your fabulous review. I would love to welcome you at home anytime. The province of Cadiz is one of the most spectacular and richest in diversity in Spain. It is at the top of any list for most types of tourism: nature/outdoors (from vast unspoilt beaches to protected wetlands and rugged mountains). Golfers and sports lovers of all kinds have over 300 days of sunshine a year to enjoy their sports/hobbies. Gastronomically speaking the entire region is famous all over Spain for its amazing diversity of trditional cuisine based on local seafood, Retinto beef, and produce from one of the most important agricultural regions in all of Europe. Cadiz is Spain´s oldest city and cultural/historical tourism is some of the richest in the world as the area has seen myriad civilizations leave their influence over the centuries: Phoenicians, Tartessos, Romans, Visigoths, Moors, etc. For wine lovers a visit to the Sherry district, easily one of the oldest and most beautiful in the world, is a must. Cadiz and the surrounding area is the birthplace and heartland for the most famous Spanish traditions: Flamenco music and dance; The Andalusian equestrian art; The Spanish bullfight; Sherry wine and tapas-culture in general. Rates are subject to change until booking is confirmed. Cancelation policy: 100% with 30 days advance notice. A cleaning fee of €60 is charged for stays of less than 1 week.